The minimum wage in New Hampshire remains at $7.25 an hour, but for Great American Restaurants it’s $10 for non-tipped workers, and soon it will rise even more. The restaurant chain may even give out bonuses based on restaurant volume. “I really don’t have a choice,” said CEO Tom Boucher. How else, he said, can he expand his staff by 50 at the Laconia T-Bones restaurant for the summer, especially with overall sales going up 5 percent? It was just a matter of time before wages started creeping up, but it has been a long time before slow and steady job creation in the Granite State reached the current workforce scarcity. But scarcity is the flip side of abundance. Almost every sector in the state’s economy is thriving. Take state tax revenues from the current fiscal year compared to last year: business taxes, up 13.1 percent; rooms and meals, up 7.4 percent; real estate transfer tax, up 16.3 percent. In a nutshell, there is plenty of work to do in New Hampshire but not enough workers to do it. There are lots of homebuyers coming back into the market, but not much inventory, especially for starter homes. The need for workforce housing has never been greater, and rents are rising because of the lack of vacant apartments. Companies need to grow, and there is not much commercial space to grow into. Scarcity eventually drives up prices, and wages, the price of labor, are going up, along with nearly every other positive economic sign. Personal income in New Hampshire increased by 15 percent from 2014 to 2015. The average weekly wage for the last quarter of 2015 was five percent higher than the same quarter in 2014. Manufacturing workers are now making $20 an hour – $1 more than they averaged in 2014. This should be no surprise. The state’s unemployment rate in May stands at a seasonally adjusted 2.7 percent, down from 3.5 percent in May 2015. But the actual number of jobs added during the period was relatively small – 7,000 in the private sector. That may not be for the lack of positions but the lack of people to fill them. Why is that? One reason may be that giant sucking sound emanating from the southern border – not Mexico, but Massachusetts. Nearly one of five New Hampshire workers commutes to a job out of state, Thibeault pointed out, citing a recent report by the state Department of Employment Security’s Economic & Labor Market Information Bureau. That’s the second highest ratio in the nation, behind Washington, D.C., and it more than offsets the 78,000 people who commute into the state to work. “This pool of out-commuters could help alleviate our labor shortage if induced to stay in state,” Thibeault said. It’s hard to compete with Massachusetts on wages, however, because the Bay State’s economy is even hotter than New Hampshire’s. In addition, the minimum wage is considerably higher in Massachusetts, drawing low-wage workers, which helps push up the whole wage structure. “We have to compete with much larger Massachusetts companies, “ said Bill Dahl, vice president of marketing and communications at Solidscape in Merrimack. Solidscape, which makes high-end 3-D precision printers for jewelry manufacturers all over the world, has doubled its workforce in four years. The competition for labor “puts continual pressure on what we have to pay people, but even after ratcheting up pay, we may not be able to offer as much,” said Dahl. So the company offers something not quite as tangible. Workers aren’t just leaving the state, they are aging out of the workforce. New Hampshire’s median age in 2014 was 42.5, the third oldest population in the nation – passing fifth-place Florida and gaining on No. 1 Maine and No. 2 Vermont. From 2005 to 2014, the average age in the Granite State has been the fastest-growing in the country. This is of particular concern to the construction industry because the work “takes a toll on you physically,” said Julie Hayward, co-owner of Hayward & Co., a Bristol-based custom homebuilder, and president of the Lakes Region Builders Association. Hayward said she’s booked through the end of this year and may turn away work because she might not be able to hire enough workers to build three homes at a time. Young people are not only in short supply, they are less willing to work. Total workforce participation has fallen in the same period as well, from 73 percent to 68 percent. And, at 27,000, there are still more people working part-time than would like to. That figure is 10,000 more than before the recession, though 12,000 lower than at its peak. Some may be discouraged from looking for work, but the nature of work has changed as well, accelerated by a recession that caused businesses to cut back on employees and outsource functions. “Instead of hiring someone for storing your data, payroll services, benefit management you hire a company,” Josten said. Even willing workers have a tough time finding an affordable place to live. The real estate market has been great – for those selling homes. Year-to-date sales have risen 20 percent, according to the latest figures from the NH Realtors Association. The median price is nearing $250,000, where it was in 2008. Sellers got 98 percent of what they asked for in May, but that’s because there were 14 percent fewer homes available than a year ago. And the median price of homes has risen 6.8 percent. As Matt Ajemian of Granite Coast Realty in Hampton, put it: “2014 was my best year ever – until 2015.” His business has gone up 30 percent from last year. With this kind of low inventory, you’d think homebuilders would be in demand. They are. Just ask any sawmill in the state, though part of that increased demand for lumber is from overseas. “We have enough people for the work, but if I get a couple of contracts I’m hoping to get I don’t know what I will do,” said Brad Sawler, owner of Oxland Builders in Stratham and the president of the Seacoast Home Builders and Remodelers Association. “I haven’t been this busy in a long time,” added De Desharnais, principal of Nashua-based Ashwood Development Companies. And there’s the other rub. Most construction workers can’t afford any of the homes they are building. And the median gross rent for a two-bedroom apartment in 2015 was $1,157, 4.4 percent more than the previous year. But don’t look for a rash of new apartment buildings. 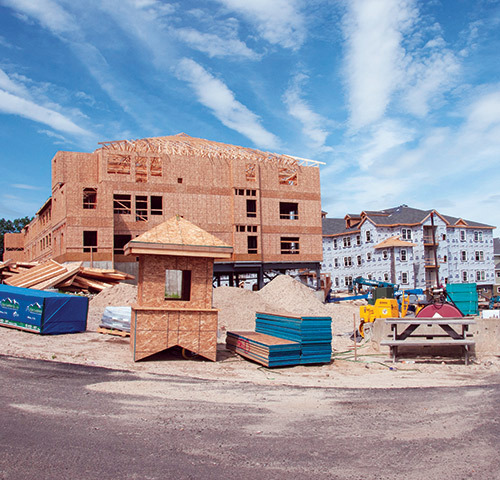 Even in multifamily housing, the trend is toward building foot-friendly condos and apartments in walkable cities like Dover, Concord and Portsmouth, “where really all the cranes are,” said Chris Norwood, president of NAI Norwood Group of Bedford. There is also a lot of demand for all sorts of commercial construction. “People have been so busy during the last two months I can’t get them to an association meeting,” joked Gary Abbott, executive vice president of the Associated General Contractors of NH. It isn’t just roadwork, such as the widening of Interstate 93. Average commercial construction contracts are up 16 percent year to date. Space is scarce all over. High-bay industrial warehousing is highly sought, thanks to Manchester Boston Regional Airport. The second busiest cargo airport in the country, is stuffed with stuff, said Norwood and the office cubicles – many vacant since the recession – have filled up too, pushing rates past $20 per square foot. Demand for retail space is growing as well, despite the demise of some big-name brands, because there are smaller chains willing to fill them, Norwood added. Of course, some malls – like the troubled Steeplegate Mall in Concord – have more than their share of vacant storefronts. 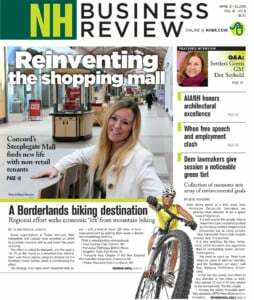 But others, like the Mall at Rockingham Park, have seen an increase in weekday traffic, thanks to a facelift that included cell phone charging stations, stronger Wi-Fi and comfortable chairs and couches, said Emily Hoang, director of marketing at the Salem mall. A cool spring cooled off pool sales at the Seasonal Specialty Store in Amherst, but the first four months of the year brought a 30 percent increase in volume. The weather also hurt sales at Concord-based Grappone Automotive Group, but overall sales are up and salespeople are needed, said CEO Larry Haynes. “Sometimes it can take four months to find someone,” he said. Overall, June 2015 to May 2016 represented the strongest sales period since 2005-2006, according to the NH Auto Dealers Association. As for the hospitality industry, the lack of snow may have hurt ski areas, but the blizzard of politicians and their entourages more than made up for it, said Mike Somers, president of the NH Lodging and Restaurant Association. “The reporters especially fill rooms and spend a lot of money,” he said. Year to date, visitors have been in New Hampshire about 10 percent longer than last year and have spent nearly 13 percent more, according to Plymouth State University’s “winter travel barometer”. The survey indicated that occupancy rates were slightly down, but room revenue was up 8.5 percent. About 16.5 million are expected to visit the state this summer, a 6 percent increase from last summer, and they’re expected to spend $2.16 billion, up 4 percent, according to the state Division of Travel and Tourism. That means a lot of help wanted signs, from the local hamburger joint to the high-tech niche firm it feeds during lunch hour.